What a lot of the uninitiated don’t realise is that there are a number of significant benefits to be had for the wider business from automating your data entry. Ok, so we all know at this stage that manual data entry is painful, inaccurate, old school (and not in a good way) ridiculously expensive and more importantly... slow. We also know that there is software out there to take that pain away. [cough] We'd recommend AutoEntry. What a lot of the uninitiated don’t realise is that there are a number of significant benefits to be had for the wider business, from automating your data entry. Data entry software enables customers to capture the data, process it and then pass that data into their accounting package. This saves users a lot of time and by extension… money. But that is only the start of where this type of software adds value. There are a number of tangible benefits at the organisation level also; scaling the business, better use of qualified staff, leading to happier staff and customers. ‍Accounting practices will spend €1 on accounting software, and they will then spend €10 on getting their data into that accounting software. This is bananas and this was the initial reason for developing AutoEntry. Obviously AutoEntry saves you money. The amount of time spent on data entry is crazy. The largest firms will have a small team of data entry staff, or maybe even outsource the work. AutoEntry enables accountancy firms to work smarter at scale. The initial benefit of reducing time spent on data entry is a given, but when you look you look at a large practice, if your customers capture their documents themselves (via phone or scan or email) then processing time is reduced even further. Happier staff. In a lot of cases, people with formal accounting qualifications will be slaving away at their desks doing data entry. This is annoying, boring and demotivating. Implementing a piece of software that takes this pain away for them will feel like a birthday present. ROI: Time originally spent on data entry is freed up to work on more valuable tasks. That qualified accountant that you have on the third floor is no longer spending their time doing data entry, now they are working on tasks that are far more valuable and your ROI on that staff member will be a lot higher now. Happier customers. Customers of an accounting practice that is using AutoEntry will see the benefits here also. 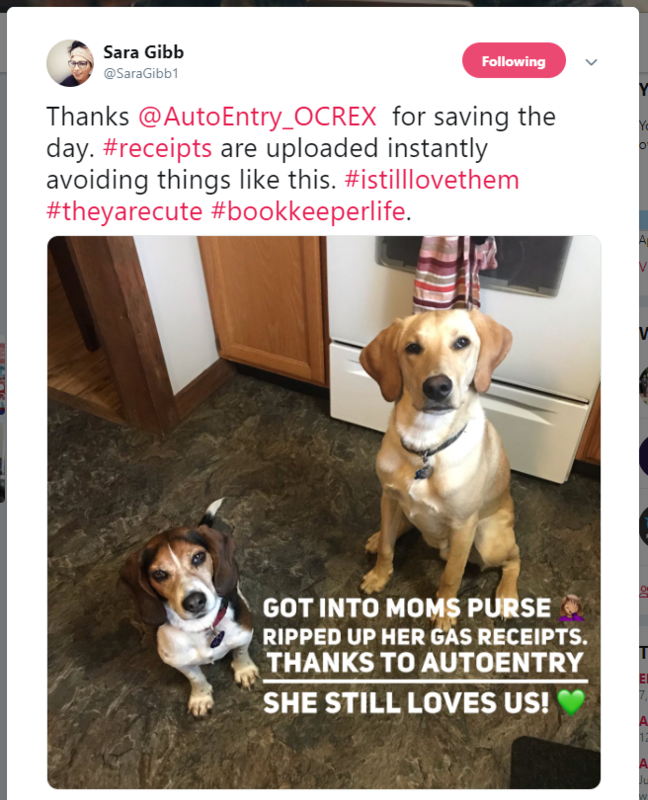 The convenience of being able to capture receipts, bank statements etc (when it suits them) and pass them through to AutoEntry themselves means that there is very little panic or hastle when it comes to whatever deadlines they might have (end of tax/financial year etc). Also, customers are savvy enough to be asking about easier ways to send their documents over. They are/will be hearing about the ease of using these apps from friends/family members. ‍SMEs (even more so than accounting/bookkeeping firms) cannot afford to spend their time doing data entry. They have a business to run and so data entry tasks are saved for when the working day is “over”. So when everybody else is locking their computer and going home, these SME business owners are staying back to do data entry (or taking it home to work on after dinner). This tweet from @saraGibb1, perfectly illustrates the real-world benefit of automating your data entry :). Unlike the large accountancy practice, these guys are doing the data entry themselves (or maybe they have “employed” family member). This time saving can change their lives. Literally. If this person doesn’t have to spend hours on data entry they can spend more time working on that new account or maybe they can go home on time and spend more time with their family/friends. This might sound a little twee, but this can have a big impact on people’s lives. We get amazing testimonials about this sort of thing. In the UK for example, MTD (Making Tax Digital) means that every small/medium business owner will have to provide a paperless tax submission at the end of each quarter. This additional requirement makes tools like AutoEntry even more important… to the point of critical. Fact: Technology will never replace the human touch. Automated technologies are designed to serve accountants and bookkeepers rather than usurp them. Skills based on years of experience and personal relationships built with clients, can’t be replaced by computers. Fact: Cloud service providers typically offer extremely high levels of data security, meaning that your sensitive data is exceptionally safe when stored in the cloud (and much more so, than physical copies in your filing cabinets). However, whilst it’s generally safe to work in the cloud, not all service providers offer the same quality of data protection, so do your homework before using a new cloud solution. Fact: No matter what size your team is, it’s a mistake to believe that your practice can’t benefit from automation. Automation isn’t just available to larger practices with the deepest pockets, as automated solutions can typically flex to accommodate firms of all sizes to suit a range of budgets. In fact, automation can have an even bigger impact on smaller firms, where resources are stretched and time is limited. You would be really surprised at how useful AutoEntry is. Our product expert, Brian Carolan, describes AutoEntry as a “simple little complicated tool”. The time savings will be obvious and you will realise this very quickly. After a little more time using the software, you will find that it is a genuinely valuable tool, and for a fraction of the cost of your other systems. AutoEntry has a free trial, check it out the website and sign up for the trial.